ANTHROPOID brings one of history’s legendary espionage events to the big screen – the WWII assassination of SS-Obergruppenführer Reinhard Heydrich by two Czech paratroopers and a few Czech resistance fighters. Heydrich, also known as the Butcher of Prague, was the architect of Hitler’s death camps and third in command after Hitler and Himmler. 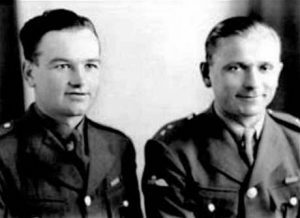 Jan Kubis (played by Jamie Dornan) and Jozef Gabcik (played by Cillian Murphy) trained for months in the UK and then parachuted into Nazi-occupied Czechoslovakia. Once in Prague, they met up with the dwindling group of Czech resistance fighters, who helped them plan and execute Operation Anthropoid. Heydrich was the highest ranking Nazi officer assassinated during WWII. This movie is a symphony compared to a Bourne movie rock concert. If you’re looking for unrealistic characters who do unrealistic things to thwart unrealistic villains with unrealistic explosions and quippy dialogue, this is not the movie for you. 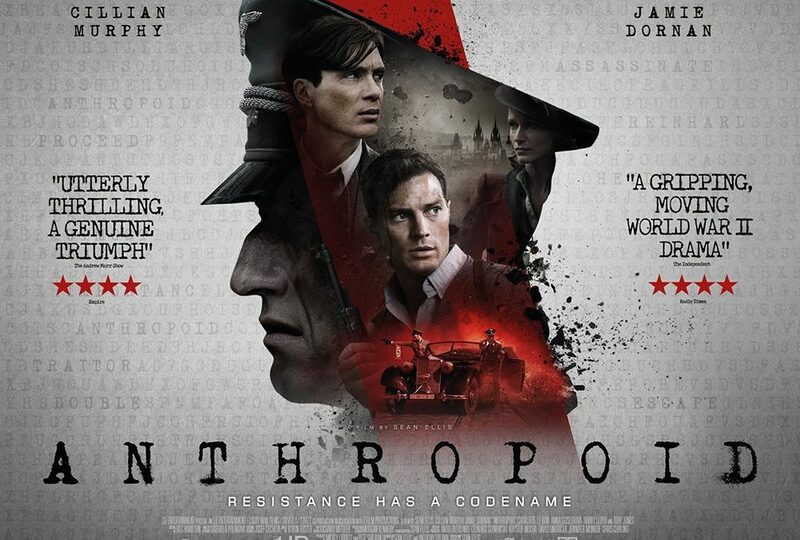 On the other hand, if you enjoy historically accurate war dramas about real events and real people, then you will likely find ANTHROPOID captivating and informative. 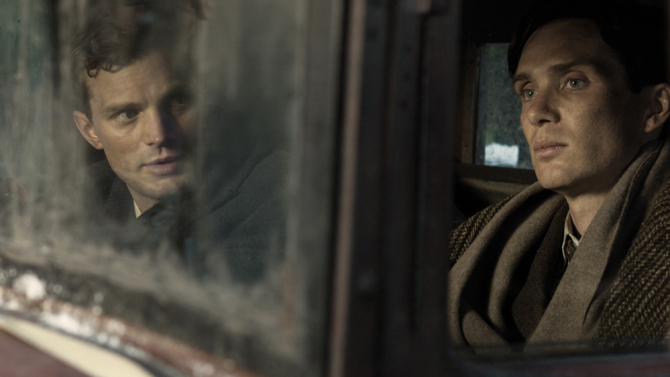 ANTHROPOID thankfully makes no effort to glamorize espionage, war, or the ordinary people made extraordinary by the demands of integrity and circumstance. Courage falters, equipment fails, and humans make stupid mistakes, while at the same time they rise over and over again with a stubborn courage and devotion to their mission and to the Czechoslovakian people. While historical sources differ on the details, the main events surrounding the assassination are well portrayed. The tension and conflict are well drawn in spite of a script that is at times a bit stiff. The stakes are clear. There is no doubt that not only are the lives of the Czech resistance fighters on the line, but also the lives of their families and the people of Czechoslovakia. The drama is not manufactured, but rather real, and raw, and tremendous in the fact that in spite of all human fears and failings, Jan Kubis and Jozef Gabcik carried on and succeeded in one of the greatest assassinations in history. In the way of disclosure, I must explain that I could not view Anthropoid with the objectivity that a reviewer should always employ. Though I was not alive at the time of the operation, and I am not of Czech descent, I admire the operatives that conducted the operation, and I have always considered the Nazis to be contemptible. That combination makes it difficult for me to be completely objective in reviewing a movie like ANTHROPOID, but I am happy to share my impressions. Most war movies and action films that depict historic events are created with an emphasis on watchability, and the pace of events, the characters, and the dialogue sacrifice accuracy to make them more fun to watch. ANTHROPOID is not fun to watch, but it is an excellent movie all the same. 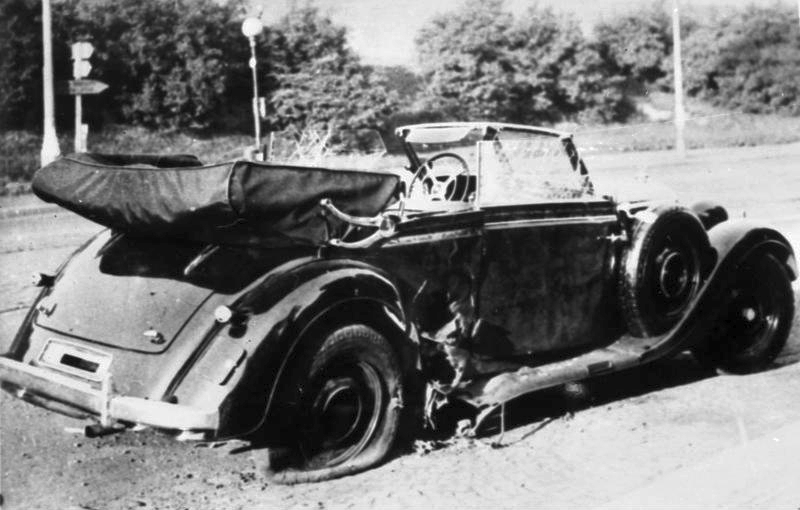 I am fairly well read on Operation Anthropoid, and I was once fortunate enough to meet a retired member of British Intelligence that had helped prepare the mission. It is my impression that the movie ANTHROPOID succeeded in closely portraying the actions and moods of the men and women that were involved in the operation. For me, this made the movie more acceptable. It seems to me that the writer, producer, and actors were perhaps somewhat reverent in their attention to detail and accuracy. The movie may be the best memorial to Operation Anthropoid yet created. As such, I applaud it. 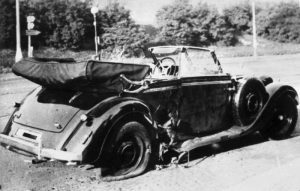 Reinhard Heydrich’s car after the attack. Interestingly, the process of researching and producing the movie has reawakened the Czech public’s interest in the event. The Czech Government has now agreed to do forensic work to try to identify bodies from unmarked graves of that period and location to try to locate and rebury the Czech resistance fighters involved in Operation Anthropoid, and give them a proper military burial. I commend the Czech people for pursuing this course. The makers of Anthropoid can be proud that their movie has a tangible result beyond, and more important than, the box office. Overall the early reviews of the movie have been tepid. We will depart from the trend and give Anthropoid the Bayard and Holmes .44 magnum – our highest rating. If the events of WWII and the moral questions surrounding those events matter to you, or if you are interested in raw espionage legend and the feats of real operatives, then you should make the short pilgrimage to see ANTHROPOID. Enjoy the symphony. Thanks so much for this, I’m adding it to my list to watch. I’ve seen much about this incident in documentaries, but it always seemed the men who pulled it off were mentioned only in passing, so I’ll be happy to learn more about them. Sounds like an interesting movie. Hollywood isn’t known for historical accuracy. I’ll have to check it out. Thanks for posting about it.